The Quiles family ties with wine date back to 1780 when it started in growing and winemaking in the lands of west the present province of Alicante. It was in the early twentieth century when Don Primitivo Quiles Verdú, degree in Enology, with various interest such as painting or photography, founded the current winery in Pinoso (Alicante), moving to the current location of Monóvar (Alicante) in 1926 to facilitate the transport of wine by rail to the port of the capital for subsequent export. In the 30s and after his studies in France Don Primitivo Quiles Quiles joined. In those years the trade to north of the peninsula were extended and exports increased mainly to Europe and North America. In 1951 Don Primitivo Quiles Pérez joined the winery , renewing and adapting it to the new demands of the market, projecting it up to this days, since the beginning he turned to be the maximum promoter of Alicante wine, furthermore, he was working for the Spanish wine industry as Vice President of the National Federation of Domestic Wine Trade. 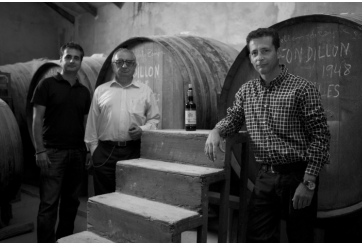 Currently his children Primitivo and Francisco are directing the winery. ﻿We have always had the conviction that our land can produce wines of the highest quality especially from our main variety Monastrell, as occurred in the past. Even when foreign varieties came to Spain that depersonalized many areas, we maintained our principles, that a wine should meets specific conditions of soil, climate and variety along with the human factor to conform its soul, which is unique in every corner of the planet. The main quality which gives us the family tradition involves values ​​that remain over time, based on personal and professional ethics manner on how we approach our clients and friends. This is the greatest legacy we have received from our ancestors. At present our goal remains to achieve a distinct and clearly identifiable product that meets the quality of the great historical wines of our land and that the most demanding consumers of old and new global markets asociate, by their special characteristics, to this corner of the Mediterranean called Alicante.